DENVER, CO--(Marketwired - March 19, 2015) - Denver Zoo is thrilled to welcome two new, male African wild dogs. Jesse and Taco, 4-year-old brothers, just arrived from the Rolling Hills Zoo in Salina, KS. Zookeepers say the brothers are settling in well and visitors can see them now as they explore their new home at the Zoo's Benson Predator Ridge exhibit, weather permitting. The brothers were born in January 2011 at Pittsburgh Zoo. They came to Denver Zoo in January through a recommendation of the Association of Zoos and Aquariums' (AZA) Species Survival Plan (SSP), which ensures healthy populations and genetic diversity among zoo animals, to build a new breeding pack with 2-year-old sisters Tilly and Cheza (CHEH-zah). Denver Zoo has been a leader in breeding and managing African wild dogs since the species arrived in 2001. A total of 28 puppies have been born at Denver Zoo since that time. The largest of Africa's canine species, full-grown African wild dogs weigh between 40 and 60 pounds and stand 30 inches tall at the shoulder. The slim, long-legged dogs have large, round ears, which not only provide excellent hearing for hunting prey, but also cool them off in the hot African climate. Each African wild dog has its own unique markings of yellow, black, brown and white. Because of this, they are alternately called painted dogs. In fact, their scientific name of Lycaon pictus means "painted wolf-like animal" in Latin. In addition to their long legs, large lungs provide the dogs with tremendous endurance. They can run at speeds of around 37 miles per hour for more than three miles while pursuing prey. Cooperative pack hunting also increases their success rate, estimated at 70 to 90 percent, and enables them to bring down animals five times their size. African wild dogs are native to the open woodlands and plains of sub-Saharan Africa. With a wild population estimated at less than 5,000 individuals, African wild dogs are classified as "endangered" by the International Union for Conservation of Nature (IUCN). Their numbers have been reduced by habitat loss, direct persecution and disease. They may contract diseases such as distemper or rabies from domestic dogs. Despite protective laws, wild dogs are still killed by herders to protect domestic livestock. Denver Zoo conservation biologists also are working to conserve the species in Botswana. Their efforts include studying the species' range and distribution and building relationships with local ranchers to discourage them from killing the dogs when they venture onto their land. About Denver Zoo: Denver Zoo brings informal science education to life, providing a unique learning experience that sparks an interest in the natural world for visitors and program participants alike. Home to 4,300 animals representing more than 600 species, the Zoo is accredited by the Association of Zoos and Aquariums (AZA), which assures the highest standards of animal care. Denver Zoo's new African wild dog brothers, Jesse and Taco, explore their yard in the zoo's Benson Predator Ridge exhibit. 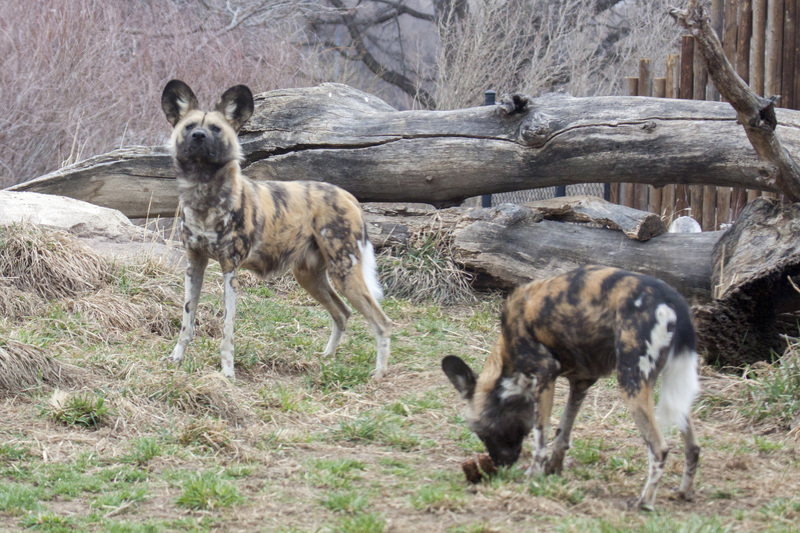 Denver Zoo is thrilled to welcome two new, male African wild dogs. Jesse and Taco, 4-year-old brothers, just arrived from the Rolling Hills Zoo in Salina, KS. Zookeepers say the brothers are settling in well and visitors can see them now as they explore their new home at the Zoo’s Benson Predator Ridge exhibit, weather permitting.